If one looks up “misguided law” in the figurative dictionary of clichéd, hackneyed metaphors, they’ll find America’s experiment with alcohol prohibition from 1920-1933 to be Exhibit A in laws that subverted human behavior, and were therefore doomed to failure. 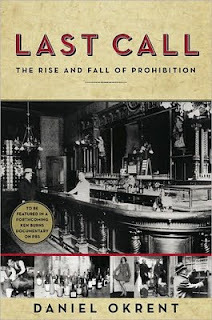 Prohibition has been a national joke as long as I’ve been alive, but as Daniel Okrent’s entertaining and wide-ranging “LAST CALL” tells us, it was no laughing matter at all for post-WWI US teetotalers and their friends. There was a huge human groundswell of support for banning alcohol that had built up for nearly fifty years, led not just in churches but in women’s’ groups (the suffragettes were absolutely central to prohibition’s implementation) and across large swaths of the country – including, even, the KKK. A mile wide and an inch deep, perhaps, because once the Volstead Act was enacted by Congress in 1919, the law started to unravel almost from day one, and the real fun began. Okrent writes the history of Prohibition with his tongue firmly planted in cheek. He knows it was a full-on fraud, and he sides with individual freedom and adult choice at every turn. Yet there’s still an even-handedness at work in “LAST CALL”. He reveres nearly-forgotten men like Wayne B. Wheeler, a man famous in his day as a leader of the “dry” cause, and tells tales of Wheeler and similar men and women with historical respect. What really comes to light in this book is just how much crime and hypocrisy came to rule the United States in the 1920s. Prohibition gave us organized crime, no doubt. Men like Al Capone and Lucky Luciano, whose opportunistic stories are told well here, came into being through their smuggling of cheap alcohol into Chicago, New York, Boston’s Back Bay etc. There are also many funny stories of American governmental leaders who were “dry” in their voting, and “wet” in their homes (of course). There’s fairly strong evidence presented that the alcohol prohibition movement also gave us the income tax (curses!). When prohibition started looking like a soon-to-be sure thing, the drys, realizing the the revenue stream from taxes on alcohol would likely be coming to and end, helped push through the income tax on American paychecks to compensate, and were able to get a sympathetic Congress to agree to it – thereby advancing their cause by leaps and bounds. 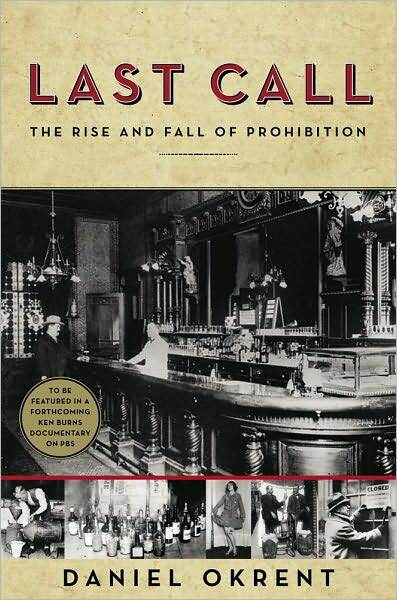 “LAST CALL” posits that basically everything had to go right for the drys in order for the 18th Amendment to pass: the end of WW1, PR miscalculations by immigrant German brewers, anti-black sentiment, the rise of suffrage, and so on. Once it did, America spent the 1920s slowly figuring out how and where they could drink again. Yes, alcohol consumption did drop during the 20s. But there’s a reason our images from the 20s contain so many fast-moving dancers in fancy clothes sipping from highballs. The banning of alcohol made the rise of the speakeasies both inevitable and extremely attractive to most Americans. They were hugely profitable. Americans found dozens of ways to skirt the law in order to get to their hooch. My favorite story is the one of the Jewish rabbis who somehow got a carve-out in the law to order & stock sacramental wine for their temples. This led to the rise of multiple “rabbinical orders” for sacramental wine from “rabbis” with last names like O’Brien and McGoohan. America was and would always be a drinking nation, it became obvious, one ever more so as immigrants with rich European drinking traditions flooded the country. This change in immigration patterns is actually one of the chief reasons that Prohibition was finally repealed with the 21st Amendment. Prohibition was wildly unpopular in the cities, and the cities were where the new immigrants, with their love of beer and vodka and red wine, were congregated in great numbers. I’ll be honest and admit that this book made me think long and hard about the legalization of other intoxicants as well, something that I’ve been reluctant to take a definitive pro-or-con position on for many years. Okrent doesn’t really touch anything after 1933, and confines the book to the period at hand without too many sweeping “what it all meant” summaries at the end. It’s not difficult to draw one’s own conclusions, though; I’ve subsequently heard no mainstream politician or organized group call for making alcohol illegal once again, and I doubt you or I will. Bonus recommendation: get this book as an audiobook, as I did, and you’ll get to hear Okrent’s snarky, nasally read through his own book - a real treat. At times it sounds like he’s cracking himself up and barely repressing his own laughter. Hedonist Jive says check it out.